After two-and-a-half years where I rarely had time to take my children to a park during the day — and I also had a large garden that made it easy to play outside at home — I now find myself in an entirely new situation. For the next few months, at least, we’re living in an an apartment in downtown Copenhagen where I can’t just send the kids out back to get a dose of fresh air and open space. I also have far more flexibility in my schedule (and far less stress in my life, but more about that later). So outings to the playground, or legeplads in Danish, have become almost a daily occurrence around these parts. 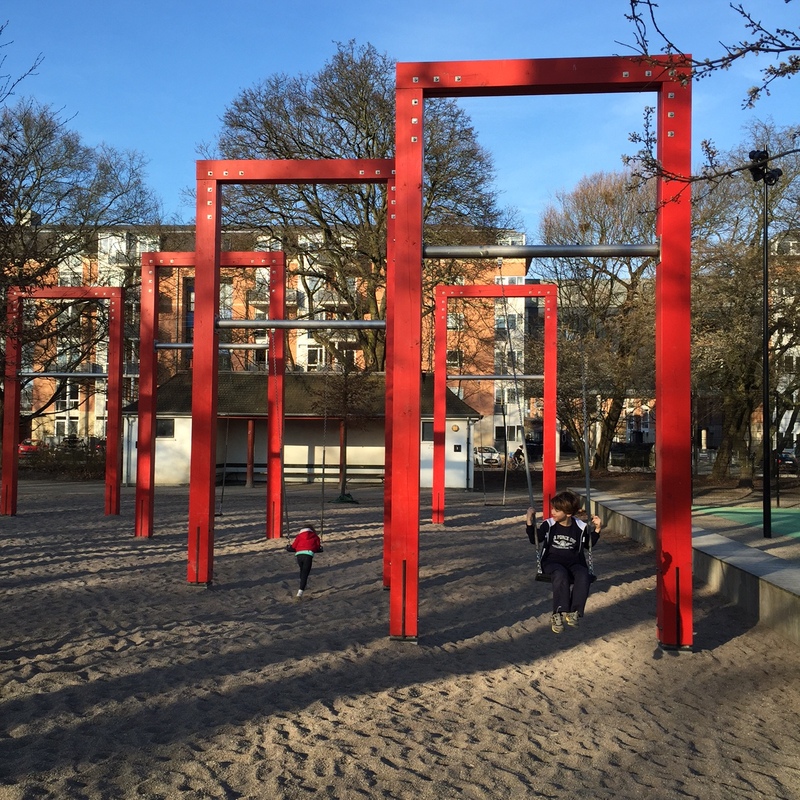 Our leisurely tour of Copenhagen’s parks and playgrounds have rekindled my great love affair with the Danish legeplads, and here’s why: 1) Thanks to a more relaxed parenting atmosphere and a less litigious society, Danish playgrounds are designed first and foremost to be fun and challenging for kids. They aren’t as wrapped up in concerns about what could go wrong and who could get sued over it. Design seems to focus more on what the park can inspire kids to do and how it can motivate kids to engage with the equipment, rather than being preoccupied with how safe every step will be. If you think this sounds like a recipe for playground accidents, you may be right. I haven’t seen the statistics on Danish playground injuries, and I have to admit that some of the slides here are shockingly steep. But I do know that this article from The Atlantic in 2014 reminded me of how much I like and embrace the idea that playing should, at least some of the time, be challenging, independent and a carry a small degree of risk. 2) Playgrounds are imaginative here! Though you, of course, see certain types of equipment across multiple playgrounds, each one has its own character and distinct features. One of our favorites in Fælledparken has used the famous towers of Copenhagen as inspiration. 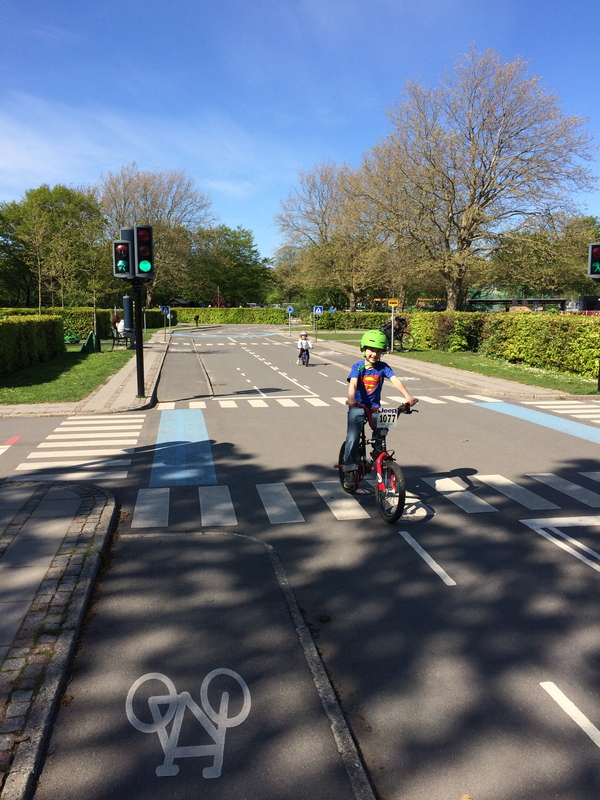 In the same park, the Trafiklegepladsen helps children become familiar with the rules of the road through a network of miniature Copenhagen streets, reconstructed down to details such as pint-sized sidewalks, bike paths, bus stops, roundabouts, and more. Another nearby park features a half-buried pirate ship on its side (tilted at a very precarious angle, I might add!). Just down the street we found a school playground with one of the coolest climbing structures that I’ve ever seen. Even Tivoli, the famous amusement park in the center of town, includes an amazing legeplads. Friends are always giving me tips for new playgrounds to visit, knowing that the experience is a bit different everywhere you go. It’s a delight to watch my kids discover each new playground, and there seems to be a never-ending supply. 3) Playgrounds are a family affair. If you stop by a playground in Copenhagen between mid-afternoon and early evening during the week, you are almost guaranteed to find several families out enjoying some fresh air and sunshine together. Sometimes you’ll see a mom pushing her kids on the swings or a dad, still in his office clothes, happily following a toddler through the sandbox. But you also often see whole families together, even as early as 3:30 or 4pm. Or you’ll see one parent ride up on a bike to join in the family outing after work. There is a wonderful culture here of making time for family, even if that just means playing together at the park for an hour before dinner. At a certain point, I’m sure our legeplads visits will become slightly less frequent, but I’m certainly enjoying them while I can! 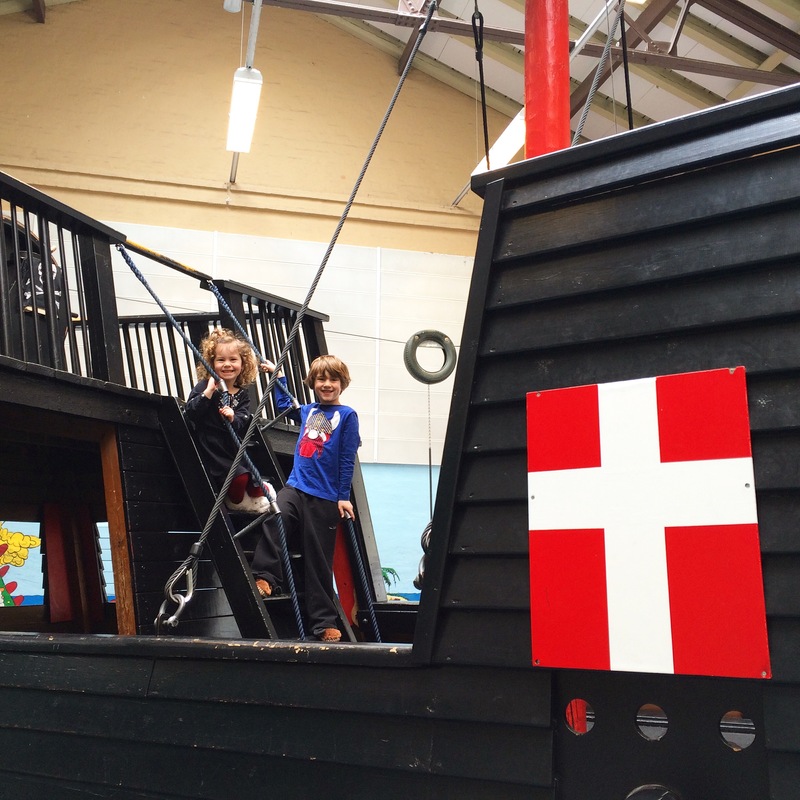 Here are a few photos of the Best Boy Ever (BBE) and Mafia Princess (MP) at various parks in Copenhagen and beyond, reveling in their new playground-packed schedule. Photos (top to bottom): 1) Playground at Øster Farimagsgade Skole 2) Moon cars, a common fixture at playgrounds throughout the city 3) Naturlegeplads in Tisvildeleje 4) Replicas of famous Copenhagen towers at Tårnelegepladsen in Fælledparken 5) Trafiklegepladsen in Fælledparken 6) Blegdamsremisen, a free indoor playground in Østerbro 7) Amazing swings in, where else, Fælledparken. I love danish playgrounds! But not as much as I love the MP and BBE! 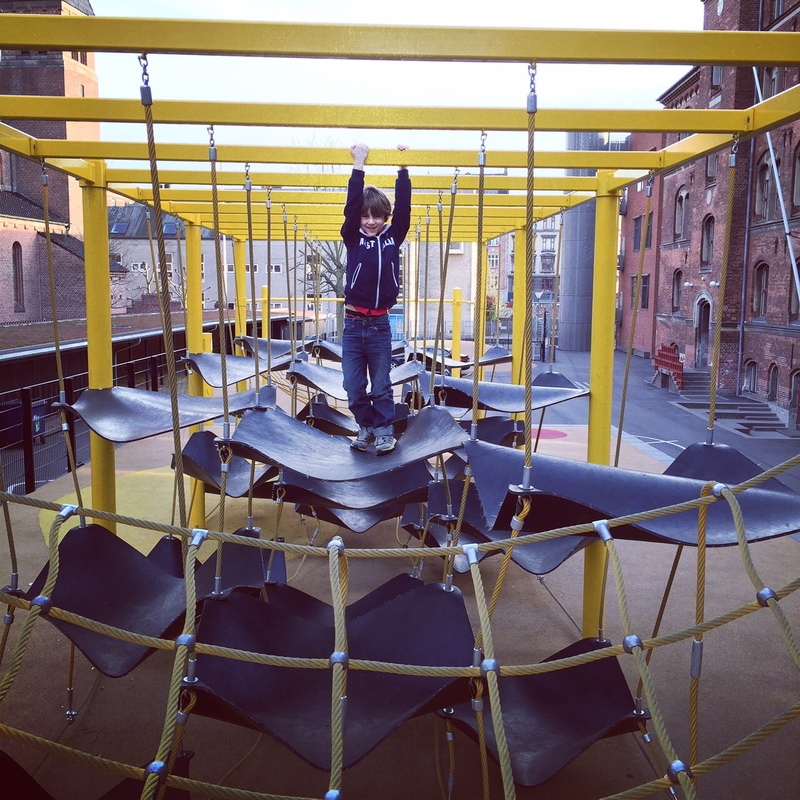 Also, I found this list of the best playgrounds in KBH and thought you might want to cross reference it with your list. The Forest Tower at @campadventuredk is stunning — whether you’re looking up to it, down from it or even if you’re right in the middle of it. There’s really not a bad angle on this beauty. I’ve been looking forward to visiting Skovtårnet (the Forest Tower) at @campadventuredk for months. It most certainly lived up to my high expectations. 45 minutes from Copenhagen, 45 metres of stunning design and 360 degree views of the Danish countryside. It’s always fun to watch the posing that happens under the blossoms in Bispebjerg Kirkegård at this time of year. Sometimes I like waking up early enough to go over and enjoy this avenue of cherry blossoms when hardly a soul is around, but I think that seeing people (even A LOT of people) out enjoying the beauty of spring offers its own sort of pleasure. I always love the view of the @uncitycph staircase, but right now it has an added touch of whimsy with this umbrella installation, in honor of World Health Day. Everyone deserves to be covered — with quality health services where and when they need them, without experiencing financial hardship. Kudos to @estrild and @sampreethi_a for bringing to life such a lovely reminder of this important point. It’s time again to stop...and smell the 🌸🌸blossoms🌸🌸 I am lucky that this little one is always up for a bike ride over to lovely Kirsebær Alle during cherry blossom season.